When New York City Democrats head to the polls on September 10 to choose their party’s nominee for mayor, they will have a once-in-a-generation opportunity to rewrite the narrative of their city. After twelve years, billionaire Mayor Michael Bloomberg, whose mix of technocratic efficiency and top-down urbanism has come to define the city, is leaving office. For voters, this means a new opening to debate some of the most critical issues of the day, from stop-and-frisk to economic development to hurricane recovery. More fundamentally, it also means a chance to revisit the meaning of the city itself, to ask: What kind of city do we want New York to be? A city for the few, or a city for the many? Among this year’s Democratic contenders, several have made thoughtful attempts to address this question. But only one candidate has offered a consistently compelling answer. That candidate is Bill de Blasio, the city’s current public advocate, and his commitment to reimagining the city in boldly progressive, egalitarian terms is the reason we are endorsing him for mayor. 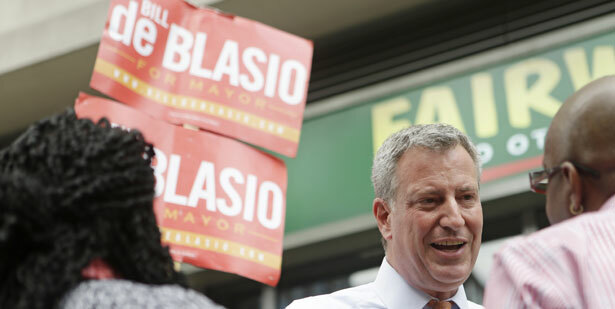 “Without a dramatic change of direction—an economic policy that combats inequality and rebuilds our middle class—generations to come will see New York as little more than a playground for the rich…a gilded city where the privileged few prosper, and millions upon millions of New Yorkers struggle each and every day to keep their heads above water,” de Blasio said in a May 30 address crystallizing his portrait of New York as a modern-day Tale of Two Cities. Unfortunately, his speech was drowned out by the frenzy surrounding Anthony Weiner’s sudden return to politics (which quickly became a distraction from the real issues thanks to the media circus surrounding the revelations of his continued sexting activities). But in placing the city’s roiling inequality at the center of his campaign, de Blasio has offered not only the sharpest description of the problem—what he called “the most urgent priority of our time”—but also the most forceful solution. As The Nation documented in our recent special issue “The Gilded City,” New York today is one of the most unequal places in the country, a city where the gulf between rich and poor rivals that of Swaziland. While the Bloomberg era has transformed parts of New York into glittering oases of livability—islands of green in which bike lanes and condos flourish—vast swaths are still waiting for the good times to trickle down. Almost half the city’s population lives at or near the poverty level; in any given year, more than 105,000 New Yorkers spend at least one night in a homeless shelter, while some 1.5 million face hunger and food insecurity. Meanwhile, the public schools crumble and public housing grows mold. And though none of this is exclusive to New York—rising inequality is a nationwide affliction—it is nonetheless one of the great outrages of the last twelve years that a city government with the power to do so much more has chosen to do so little. There is a lot to like, from proposals on education and homelessness to public safety—but among the ideas that we found most persuasive is his unusually diverse economic development strategy, which embraces not only job creation but also enhanced labor protections and long-overdue investments in New York’s once-great public universities. De Blasio was a major force behind living-wage and paid-sick-leave legislation—indeed, he fought for much stronger bills than those ultimately passed by the City Council—and his platform contains additional policies to increase wages for the city’s working poor. He is also steadfastly pro-union, which is both a welcome change and a crucial one after twelve years of an administration so hostile to labor that all 152 of the city’s public unions are without contracts. And in an effort to stanch New York’s affordable-housing crisis, he has put forward an ambitious plan to build or preserve nearly 200,000 affordable-housing units over the coming decade, while pledging to remove wasteful tax breaks for real estate developers. Finally, de Blasio has been one of the fiercest critics of the NYPD’s stop-and-frisk policy, which has seen hundreds of thousands of young black and Latino men wrongly detained and subjected to searches. And of the candidates, he has been the most vocal and persistent supporter of a bill to prohibit racial profiling and impose greater police oversight. He has also pledged to replace Police Commissioner Ray Kelly, who stubbornly defends stop-and-frisk. Other candidates have also advanced strong ideas. Former comptroller and 2009 mayoral candidate Bill Thompson, for example, deserves credit for proposing measures to fight what he calls the city’s “growing, climbing, pervasive, insidious poverty,” including giving homeless families priority for Section 8 housing and supporting paid sick days for the many workers who don’t have them. And we welcome his solid proposals to fund the MTA’s capital programs (a theme that Sal Albanese has extended in an impressive set of proposals to improve transportation and street safety). But these ideas often feel more like well-meaning tweaks rather than the far-reaching measures required for change. Moreover, Thompson’s confusing stance on stop-and-frisk and police oversight—he has condemned racial profiling strongly, but refused to support City Council bills to rein it in—raises questions about how vigorously he would fight for sorely needed reforms. Comptroller John Liu, for his part, has run an unabashedly progressive campaign that has not shied away from taking on some of the most contentious issues of the last few years. For instance, he has condemned unequivocally the NYPD’s surveillance of Muslim New Yorkers—a position that we strongly urge other candidates, including de Blasio, to adopt. Yet the allegations of fundraising improprieties within his campaign have tarnished his candidacy in ways we can’t overlook. City Council Speaker Christine Quinn has also presented some useful ideas and impressed us with her willingness to engage in hand-to-hand combat with the Bloomberg administration on certain issues, such as the city’s harmful homelessness policies. But as speaker, she has all too often used her power to protect corporate and real estate interests and to block measures intended as a progressive counterweight to the Bloomberg agenda. Most egregiously, she refused for more than two years to allow a vote on paid-sick-leave legislation. And, of course, she played a central role in overturning term limits in 2008, thus helping Bloomberg and herself to four more years in office. New Yorkers had already voted twice in favor of term limits, and they deserved better. They deserved politicians who would honor their explictly stated will.